In 1869, our great-grandfather Adalbert Fritz founded his company in Thuringia. When his son Franz Fritz, our grandfather, entered the company, the company name changed to "Adalbert Fritz & Sohn". 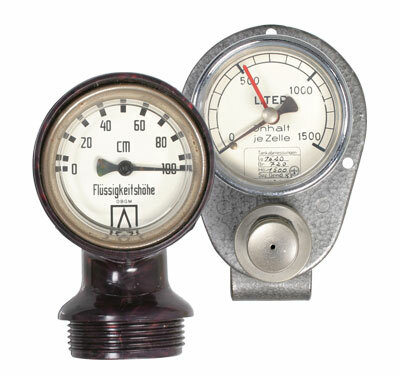 AFRISO became a globally renowned brand for temperature and pressure measurement. For 50 years, the company focussed on glass thermometers, medical glass instruments and laboratory equipment; then, a small, thin-walled, circular and concentrically shaped metal sheet completely changed the AFRISO world in the 1920s. Two diaphragm half shells form a capsule element which expands or contracts depending on the pressure. This pioneering invention became the foundation for a host of innovative products: Precision pressure gauges, blood pressure measurement instruments and temperature controllers became the most important products for the time up to 1945 and the new beginning after that. After World War II, Franz Fritz and his son Georg, our father, rebuilt the company in Kleingartach and in Güglingen in Württemberg. The capsule element was used in pneumatic level indicators which marked our entry to the fuel oil market. Back then, we developed overfill prevention systems and leak monitoring systems for the safe storage of mineral oil products, and technologies for environmental protection become the credo and mission for the future product portfolio. AFRISO secured the market leadership in this sector. Product development revolves around the motto "Technology for Environmental Protection" which is one of the key pillars of our corporate strategy. The early 1960s marked the beginning of the internationalisation of AFRISO. The oil crisis in 1973/1974 triggered the development of a comprehensive range of products for the efficient and environmentally friendly operation of heating systems. In 1972, we pioneered on the market with the first portable flue gas analyser and we have been a key driver in the development of mobile measurement technology ever since. After the political change in Eastern Europe, subsidiaries were founded in Hungary, Romania, the Czech Republic, Poland, the Ukraine, Russia and China. Today, the AFRISO family comprises 19 branches. Together with more than 20 representations, we offer our customers optimum consulting and superior supplier's reliability all over the globe. We are now the fourth Fritz generation to lead the company. We are very well aware of the benefits of a medium-sized company with a long tradition of innovation, run by its owners. The value of a handshake still applies in a figurative sense, and this is something everyone can count on – employees, suppliers and customers. For us, the past is not a closed chapter but an incentive to constantly adapt to changing market requirements. After 150 years, we are embracing a promising future, which we would like to shape with trend topics such as "smart home".